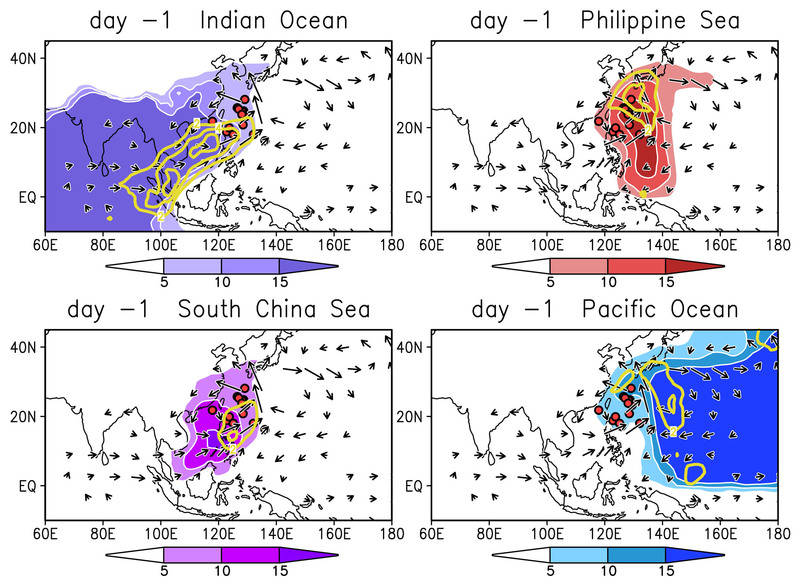 The modulation of large-scale moisture transport from the tropics into East Asia in response to typhoon-induced heating during the mature stage of the Baiu/Meiyu season is investigated using the Japanese reanalysis data (JRA-55), aided by a Rayleigh-type global isotope circulation model (ICM). We highlighted the typhoons that migrate northward along the western periphery of the North Pacific subtropical high and approach the vicinity of Japan. Anomalous anticyclonic circulations to the northeast and southeast of typhoons and cyclonic circulation to their west become evident as they migrate toward Japan, which could be interpreted as a Rossby wave response to typhoon heating. These resultant anomalous circulation patterns form moisture conveyor belt (MCB) stretching from the South Asian monsoon region to East Asia via the confluence region between the monsoon westerlies and central-Pacific easterlies. The ICM results confirm that the well-defined nature of the MCB leads to penetration of the Indian Ocean, South China Sea, Philippine Sea, and Pacific Ocean water vapors into western Japan. The typhoons have the potential to accumulate large amounts of moisture from distant tropical oceans through the interaction of their Rossby wave response with the background flow. In the case of a typical typhoon, the total precipitable water around the typhoon center as it approaches Japan is maintained by the moisture supply from distant oceans rather than from the underlying ocean, which indirectly leads to the occurrence of heavy rainfall over western Japan. *Please refer to the following manuscript. Fig. 9. Composite maps of contributions to precipitable water (shades) and its band-pass filtered anomaly (yellow contours) by transports originating from four major regions (the Indian Ocean, South China Sea, Philippine Sea, and Pacific Ocean) on day -1. See Fig. 8 for the four regions. The shaded and yellow contour intervals are 5 mm and 2 mm, respectively. Anomalies of less than +2 mm have been suppressed. Vertically integrated moisture flux anomalies are denoted by vectors. The locations of the typhoons are shown with red circles. Copyright Laboratory of Meteorology and Climate Dynamics . All Rights Reserved.